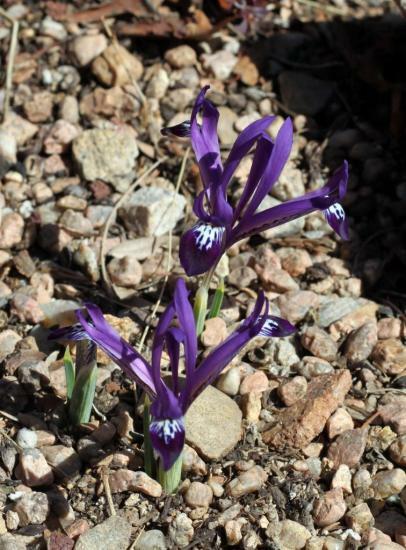 Reticulata irises, Mathew's subgenus Hermodactyloides from western Asia, are another section of bulbous irises. Leaves of this section are grey green and square or almost cylindrical in cross section. 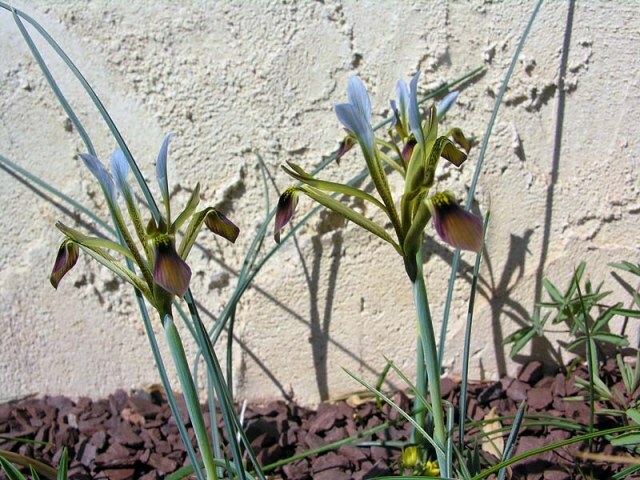 Bulbs have netted tunics and the flowers long tubes. 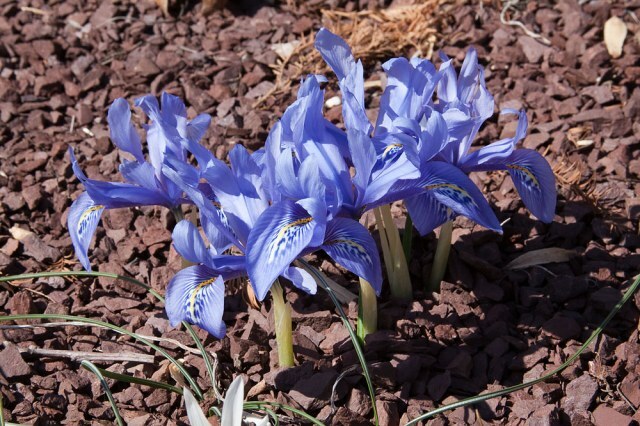 They are small plants that are mostly very hardy, (with the exception of Iris vartanii which will withstand limited frost), flower in early spring, and are dormant in summer. 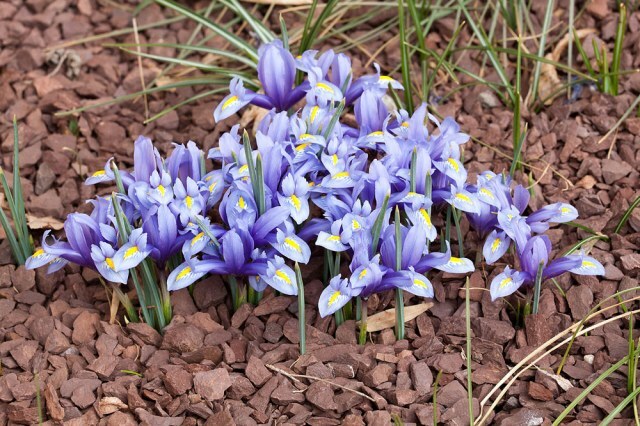 They are suitable for rock gardens, bulb frames or alpine houses and should be planted in well-drained soil that can dry out in summer. 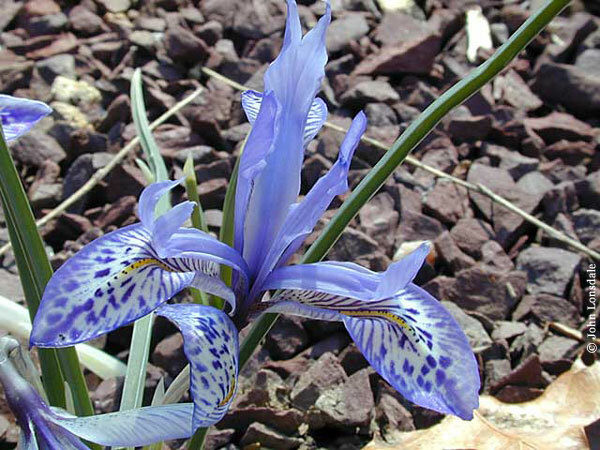 Rodionenko considers the reticulate irises as a separate genus, Iridodictyum. 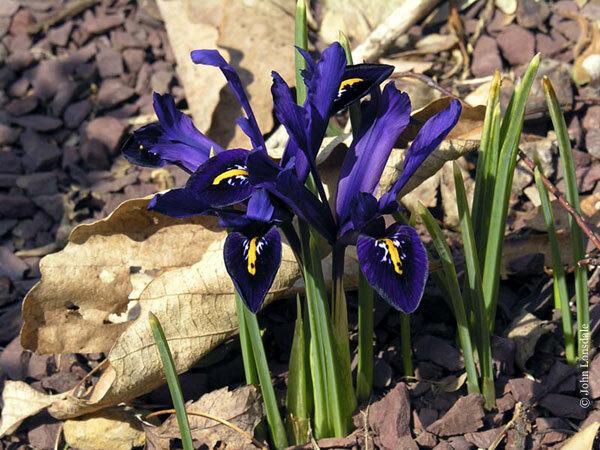 Iris bakeriana Foster is a synonym for Iris reticulata var. bakeriana. 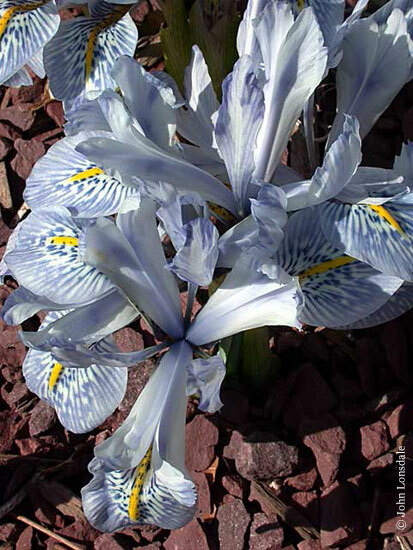 Iris danfordiae (Baker) Boiss. 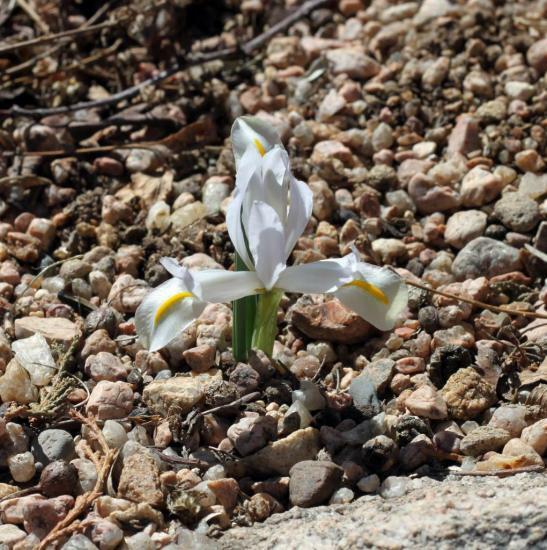 is from mountain locations in Turkey where it flowers near the snowline. 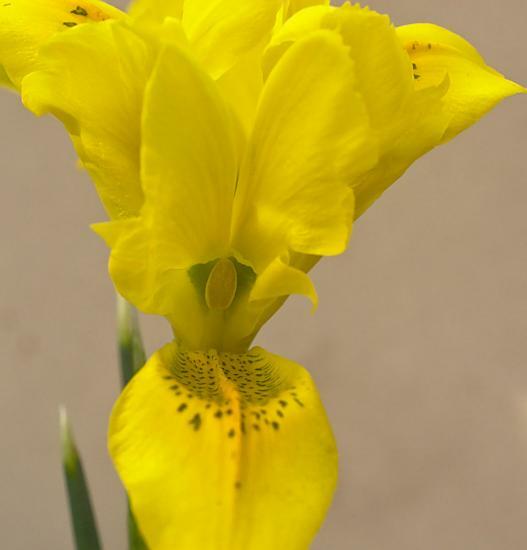 It has bright yellow dotted green flowers with a deep yellow or orange crest. 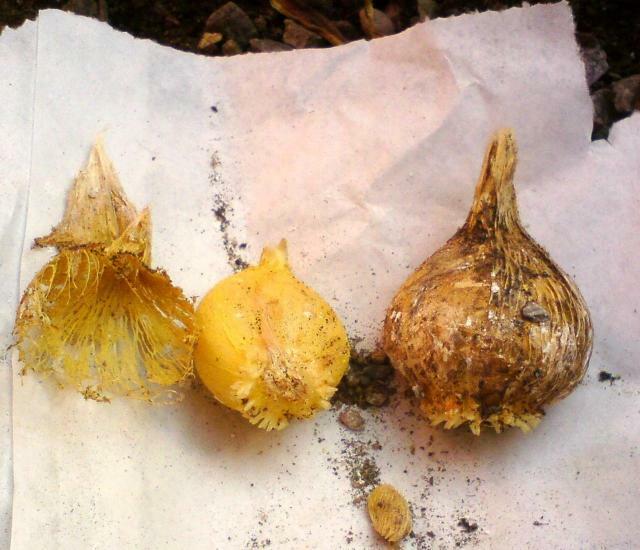 Bulbs need to be planted deeply or they will split into smaller non-blooming bulbs. The normal form in commerce is a sterile triploid. 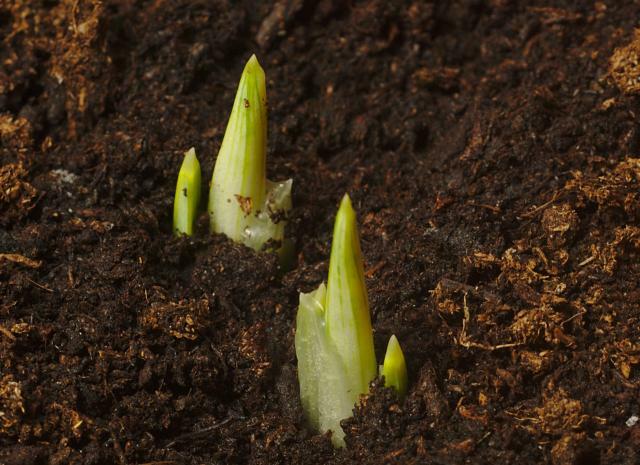 Planted very deeply and/or fed heavily, it will flower reliably. 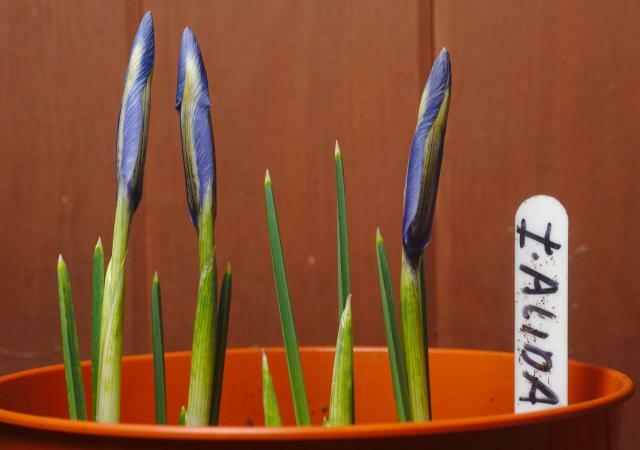 The diploid, fertile plant is much smaller. 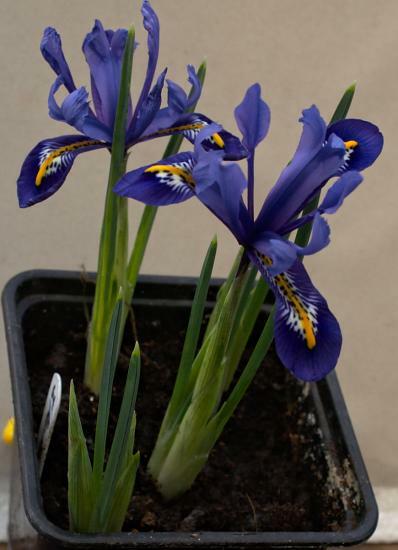 It is one of the earliest of these iris to flower, without the leaves, and is scented of honey. First photo by John Lonsdale and the remainder by David Pilling. 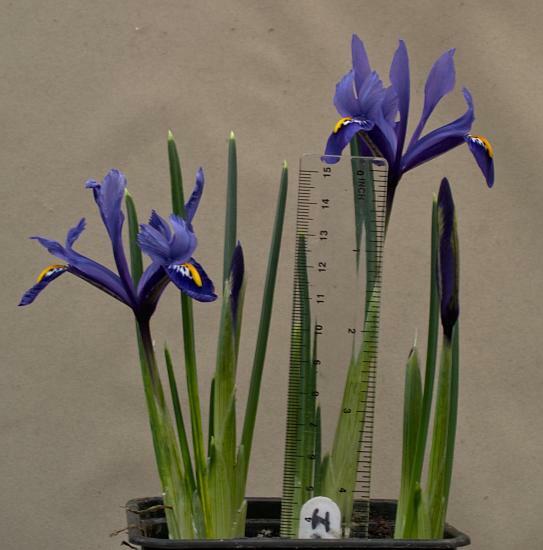 Photo 2 of commercial bulbs on a 10 mm grid; photo 3 of resulting flower; photo 4 of plants with a 6" (150 mm) ruler. 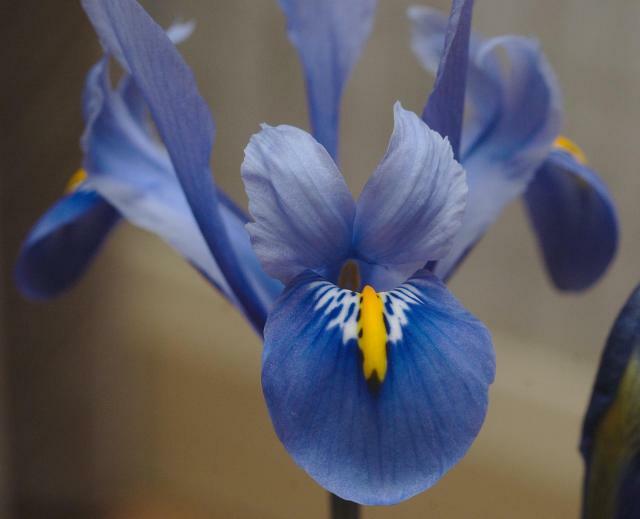 Iris 'Harmony' is a popular hybrid of Iris histrioides and Iris reticulata with a nice contrast of blue and yellow. Photo 1 taken March 2005 by Jay Yourch. Photos 2-5 taken early February 2015 by David Pilling. 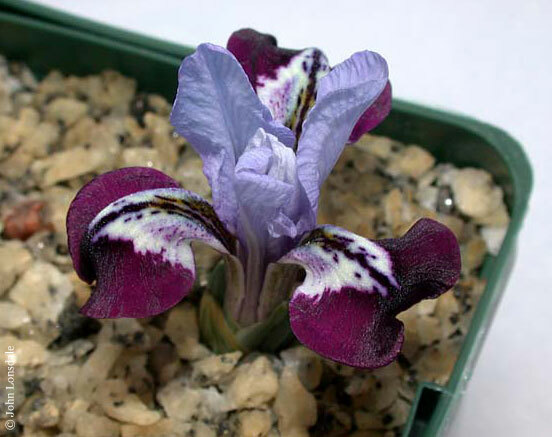 Iris histrio Rchb.f. 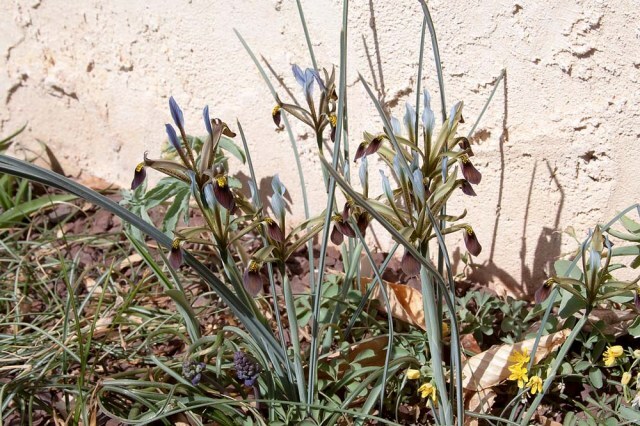 is a small species from from southern Turkey, Syria and Lebanon and has beautiful baby blue flowers with intricate markings, shading to purplish blue at the base. First photo by Mark McDonough taken April 7, 2004, at 7:00 AM when the temperature was 28 degrees Fahrenheit (frozen). Other photos by John Lonsdale. 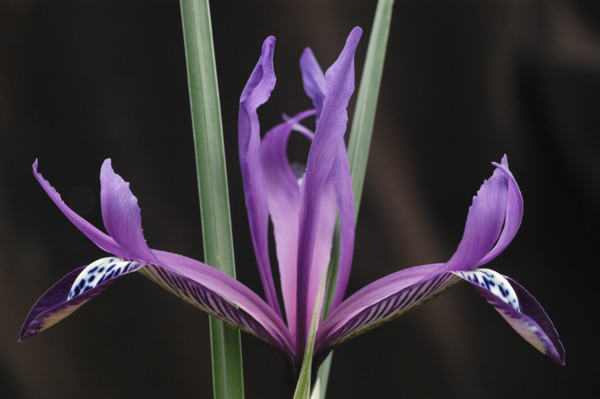 Iris histrio ssp. aintabensis (G.P.Baker) B.Mathew is from southern Turkey. 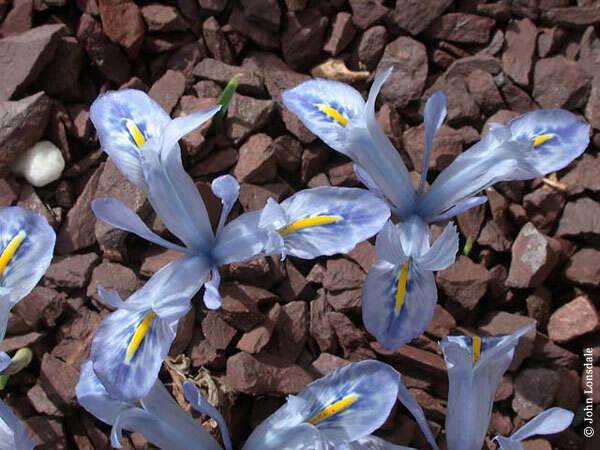 No longer considered a subspecies by some authorities, it has pale smaller blue flowers that are splashed darker on the falls and with a yellow or orange ridge. 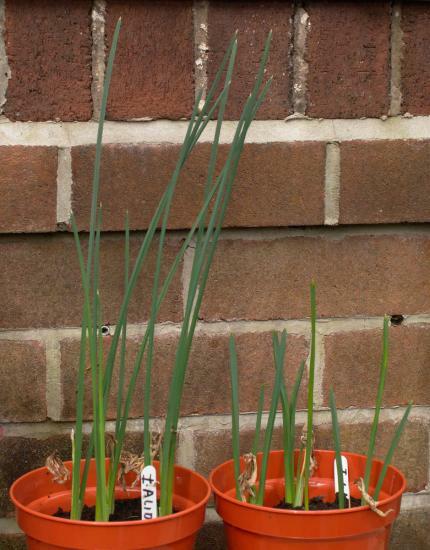 It is reported to be easier to grow than the species. Photo by John Lonsdale. 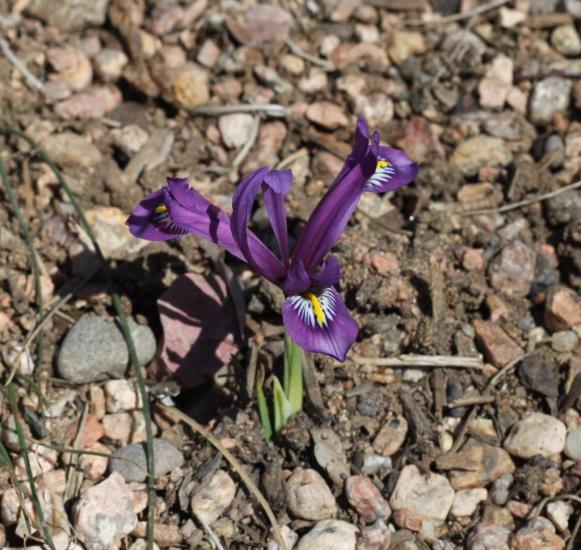 Iris histrioides (G.F.Wilson) S.Arn. 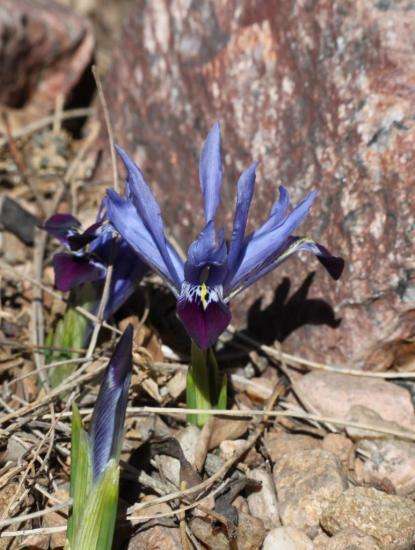 is a reliably hardy species from Turkey with large 2-3" (6-7 cm) blue flowers, spotted falls, and a yellow ridge. 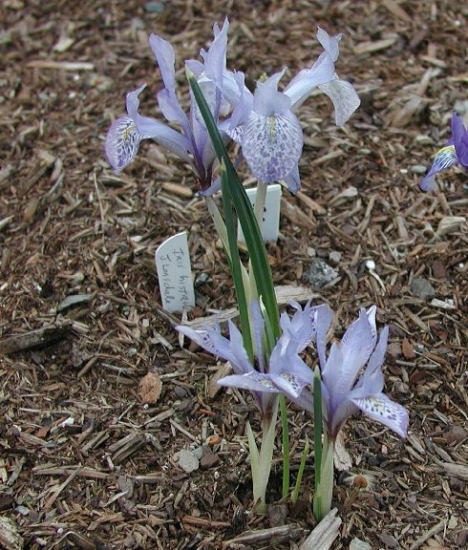 Iris histrioides var. 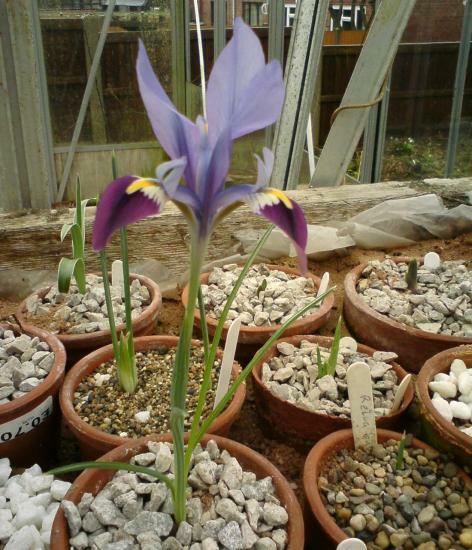 sophenensis (Foster) Dykes is no longer considered a variety by some authorities. 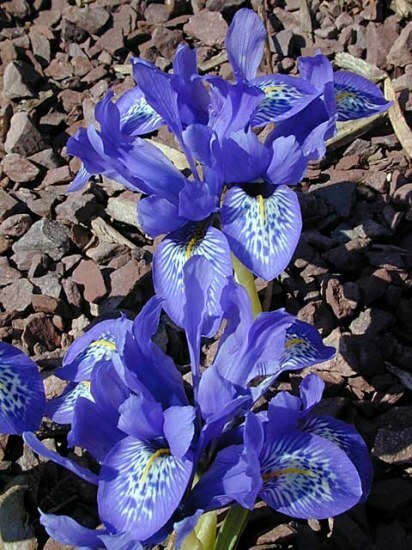 From Turkey, it is deep violet-blue with little veining or spotting, narrow petals and a yellow ridge. Photo by John Lonsdale. 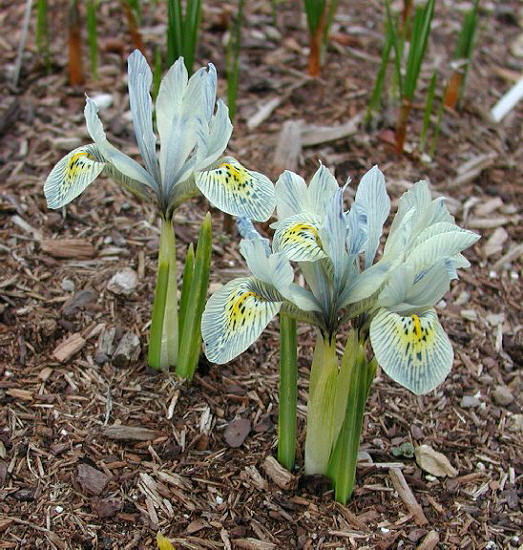 Iris histrioides 'Angel Tears' is a blue flowered cultivar with a honey mark on white ground with a small yellow vein. Photo by John Lonsdale. 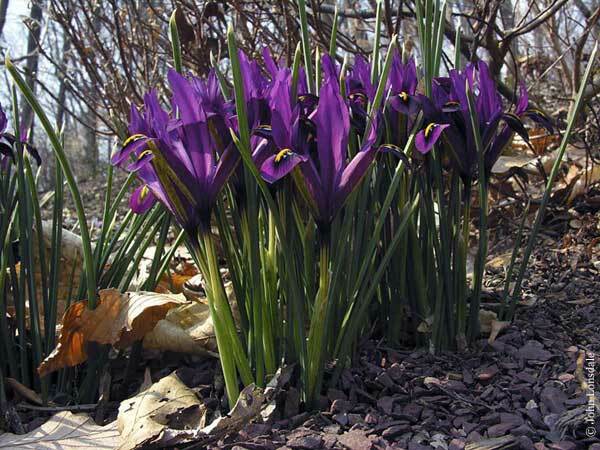 Iris histrioides 'George' is a cultivar with fragrant plum purple (with a touch of yellow) flowers. Photo by John Lonsdale. 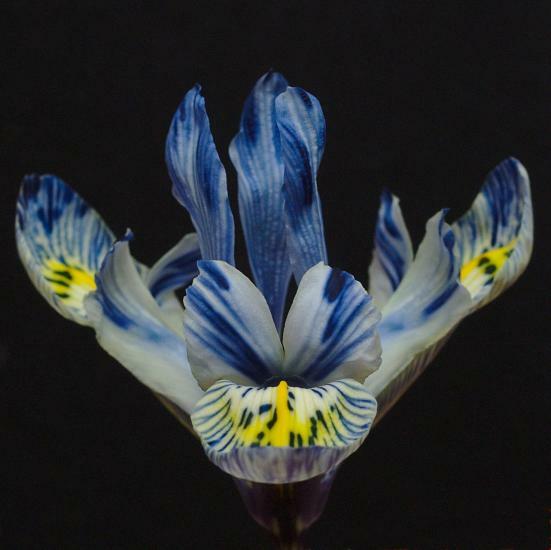 Iris 'Katherine Hodgkin' (sometimes spelled 'Katharine') is a justifiably coveted reticulata iris hybrid of Iris winogradowii and Iris histrioides. 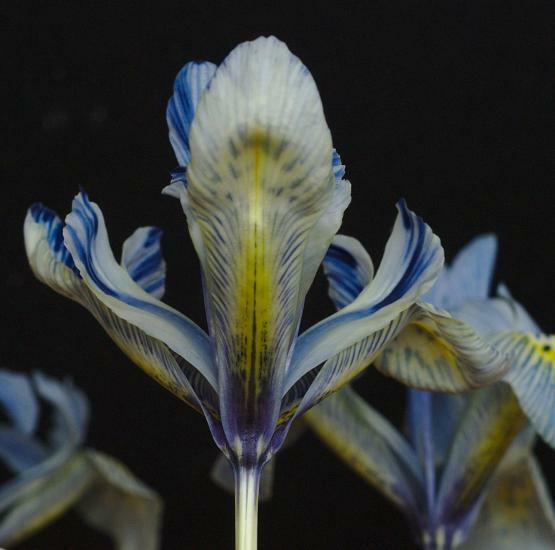 When it first opens, the flowers have an ethereal color scheme that's hard to describe; a tinge of sea-green suffused with powder blue and fabulous intricate markings. 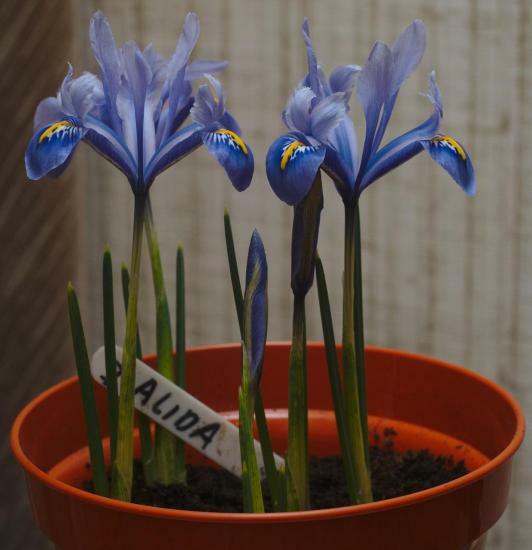 The cross was performed by E. B. Anderson in England in the 1960's; he named the plant after the wife of a fellow enthusiast, Eliot Hodgkin (mother of Sir Gordon Howard Eliot Hodgkin). The first two photos by Mark McDonough were taken April 7, 2004, at 7:00 AM when the temperature was 28 degrees Fahrenheit (frozen). 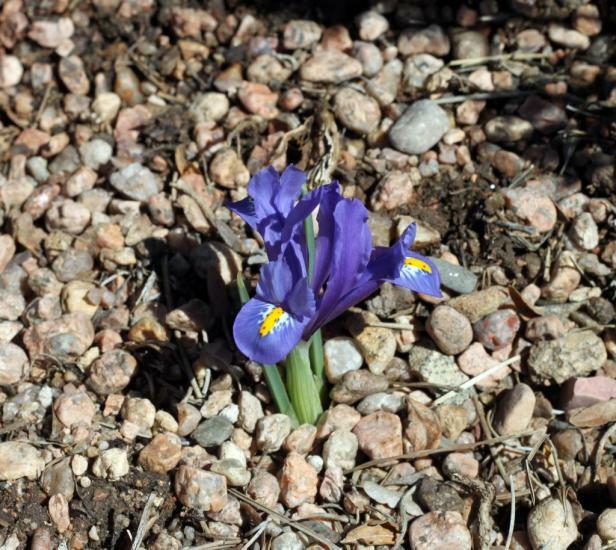 These irises don't care about such adversity and keep their flowers wide open anyway. Two similar views are here, one showing the markings with better clarity. A third photo from Peter Maynard shows this species performing in the open garden in the United Kingdom. 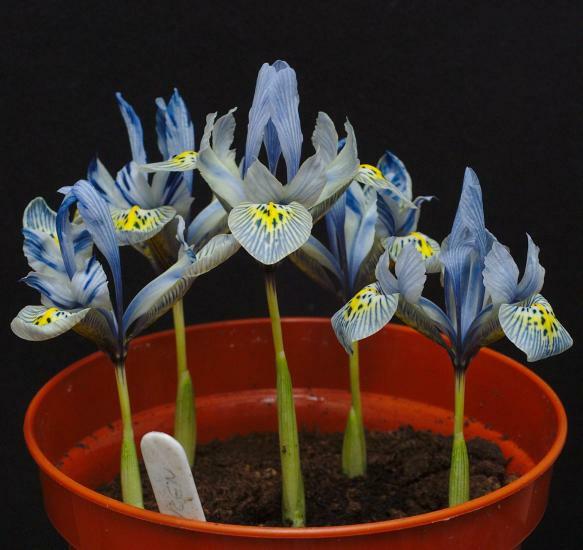 Photographs by David Pilling; the first shows bulbs on a 10 mm grid. 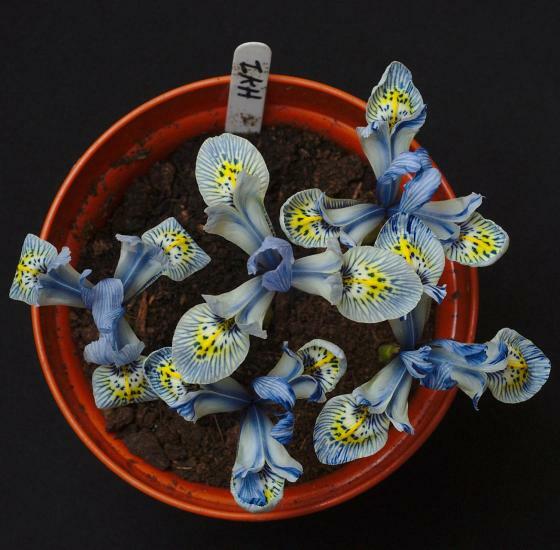 Iris kolpakowskiana Regel is from the Tien Shan Mountains, Turkestan where it is found on hillsides in wet sticky clay that dries out in summer. 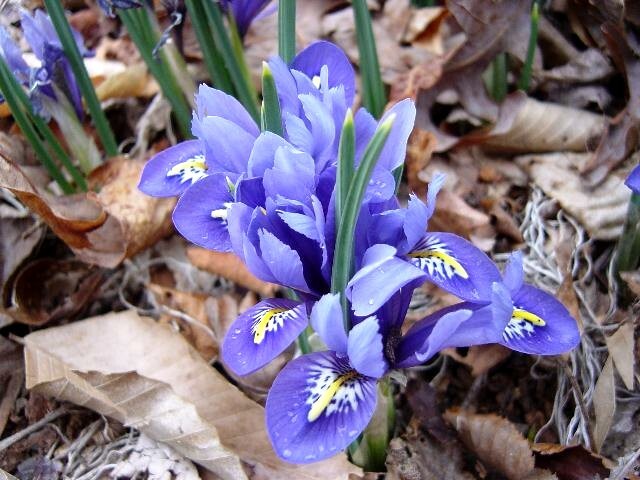 It has three or four narrow channeled leaves and pale lilac-blue flowers with a deep reddish-purple blade to the falls and an orange-yellow center ridge. 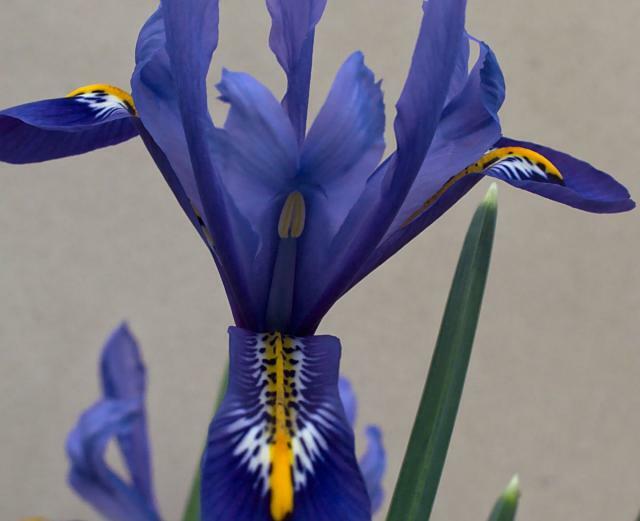 Note from Peter Taggart: "The forms I have and have grown have distinctive bulbs with a longer neck than other reticulata Iris (tear drop shaped). The tunics are ridged vertically and the inner tunics are yellowish." Photos 1-3 by John Lonsdale, photos 4 and 5 of the cultivar 'Solo' by Peter Taggart. 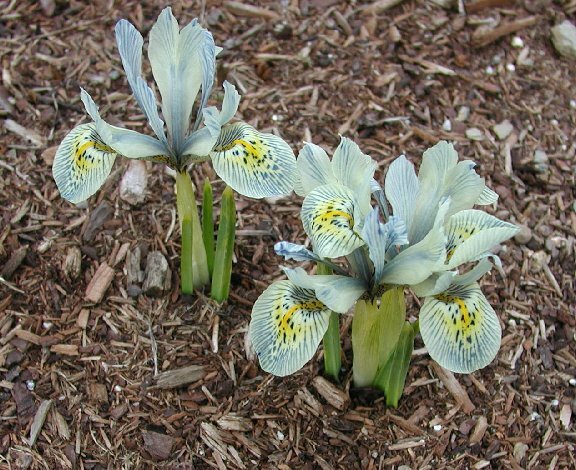 Iris 'Lady Beatrice Stanley' - Another desirable hybrid, this one is wedgewood blue and has wide falls that are intricately marked. First photo by Mark McDonough taken April 7, 2004, at 7:00 AM when the temperature was 28 degrees Fahrenheit (frozen). The rest of the photos from John Lonsdale. 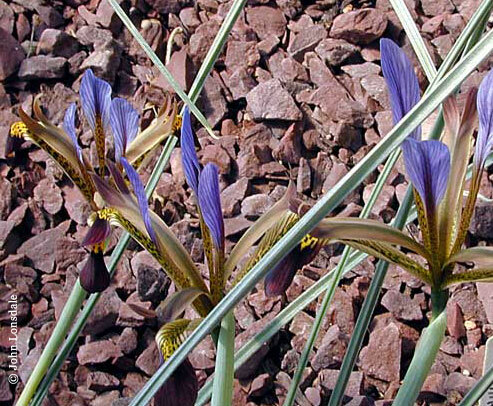 Iris pamphylica Hedge is from southern Turkey where it grows in rocky places. 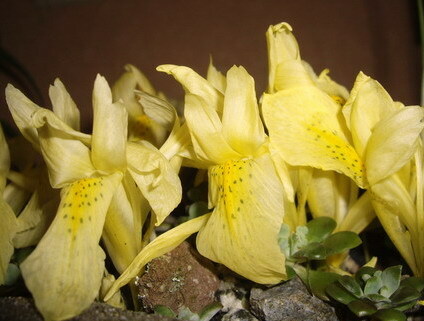 It has flowers carried on a stem (unlike other species). 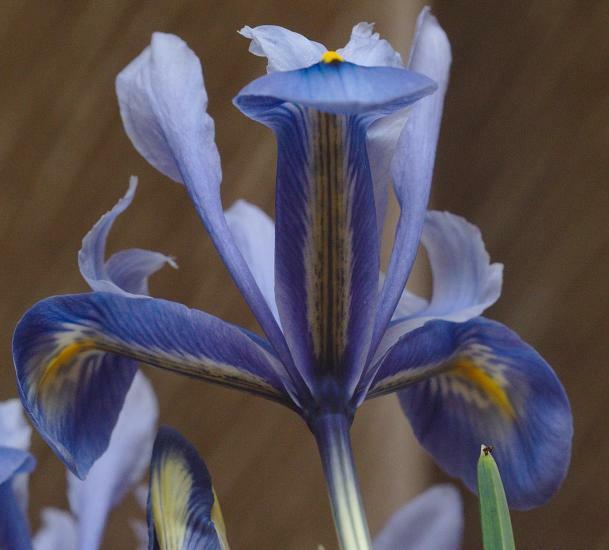 Standards are blue with purple-brown falls with a yellow blotch. Photos by John Lonsdale. 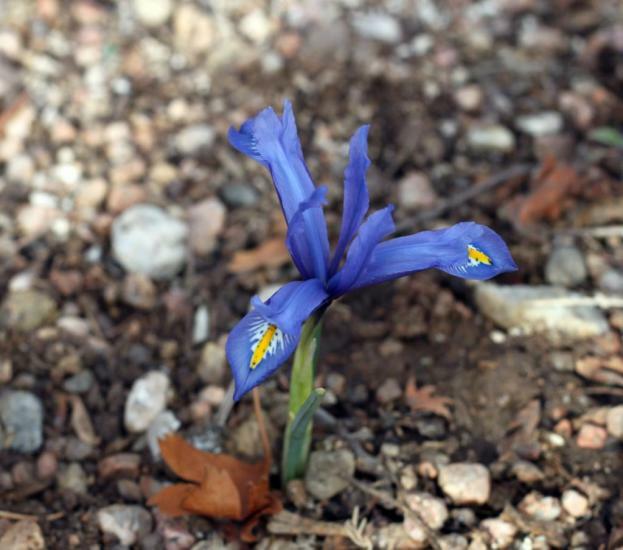 Iris reticulata M.Bieb. 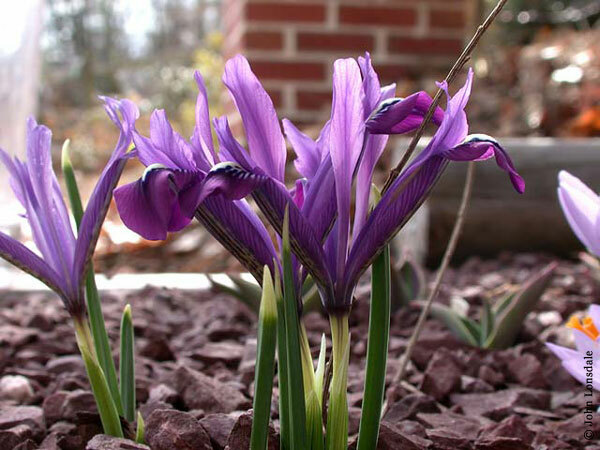 is the best known species with a wide range of colors from blue to violet to purple. 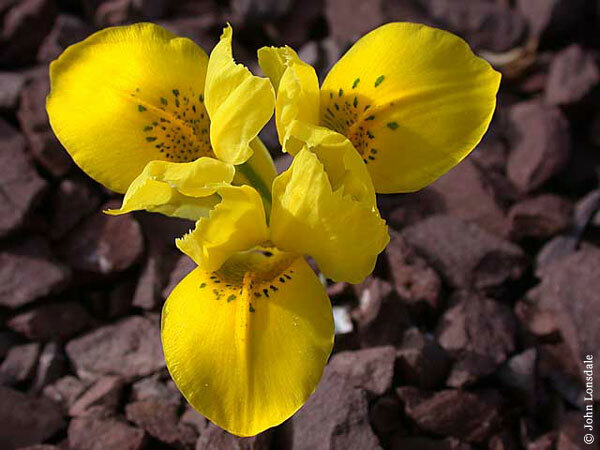 It grows in mountain meadows and rocky hillsides in Turkey, Iran, Iraq, the former USSR, Caucasus, and Transcaucasus. It is 3-6" (7-14 cm. ), usually with a bold stripe of yellow in the center of the falls. 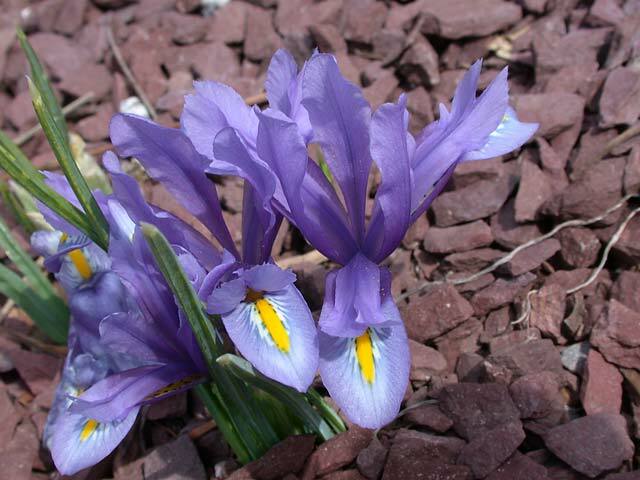 Flowers can be scented, and one common name is 'violet-scented Iris'. 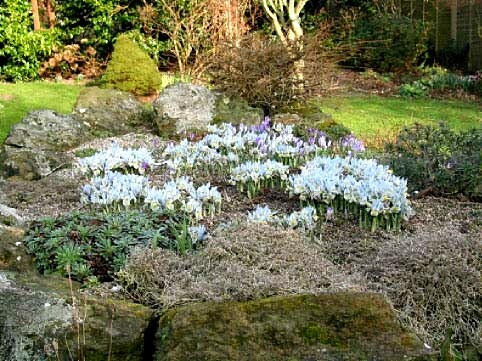 The name refers to the netted or reticulate bulb tunic. 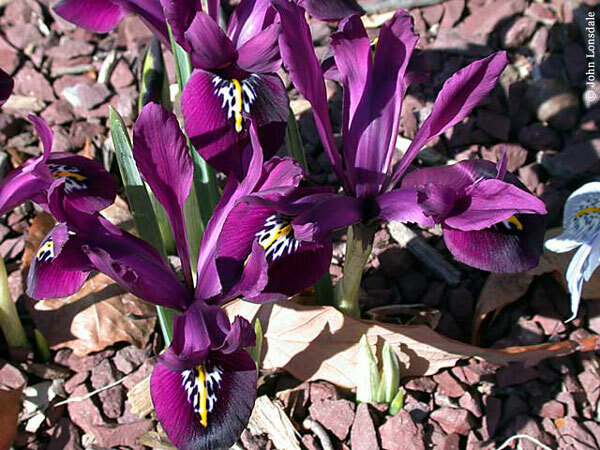 There are a number of garden plants with cultivar names and some that are hybrids with other species. Photos by John Lonsdale. 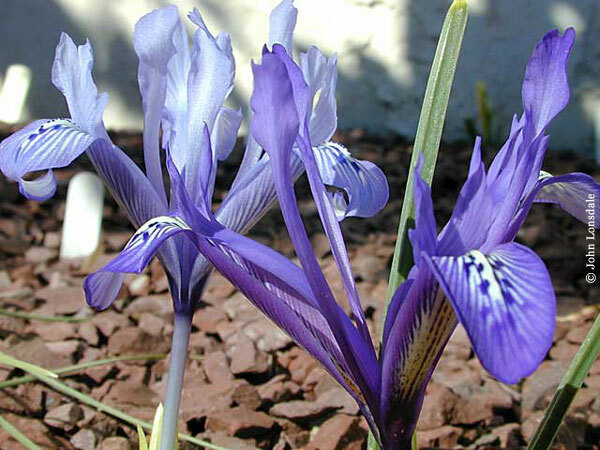 The form once considered to be Iris hyrcana has clear blue flowers and a bright yellow ridge. 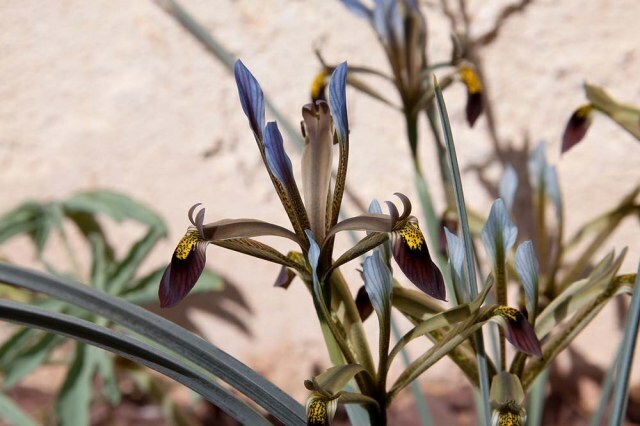 It grows in Iran and adjacent areas and is best grown in a frame or alpine house. The traditional form of I. hyrcana in cultivation is a little over an inch high in flower; the form "talysh" is much larger and even earlier flowering, sometimes in November in the UK but more often in January for me, followed by the small form in early February. Photos by John Lonsdale and Bob Nold. 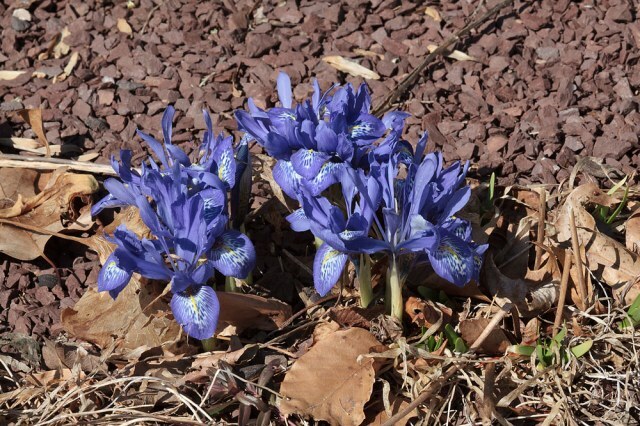 This apparent form of I. reticulata is sometimes offered as "Iridodictyum kopetdaghensis" or "Iris kopetdaghensis." 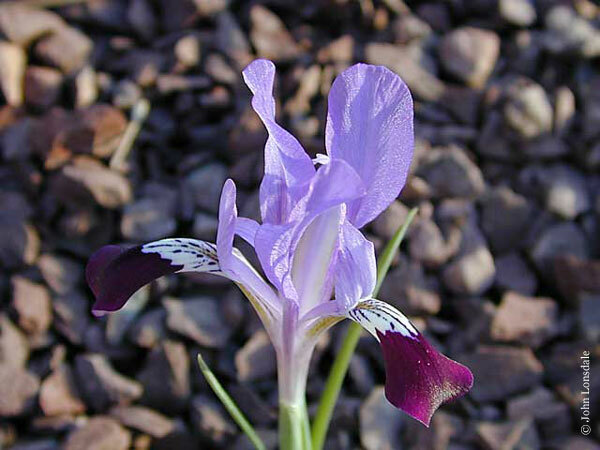 Kew Gardens regards Iridodictyum as a synonym of Iris, but says the status of Iridodictyum kopetdaghensis is unresolved. 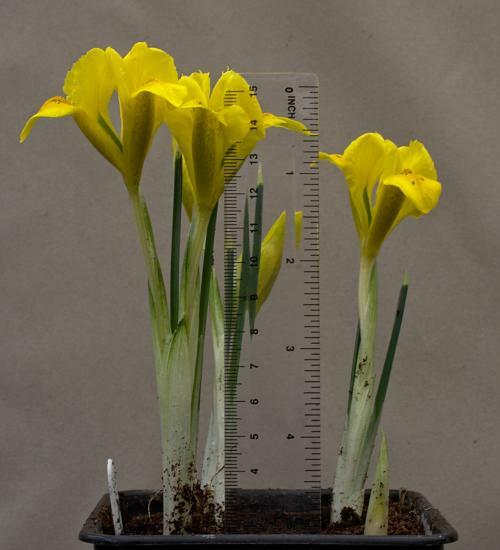 To make things more confusing, there is a greenish-yellow Juno Iris species named I. kopetdagensis (no "h"). 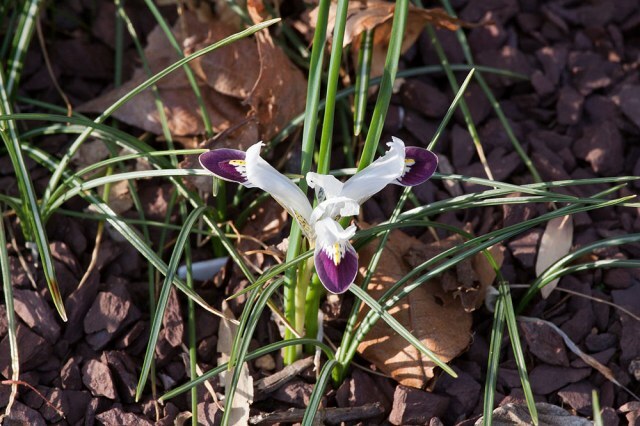 Whatever the name, this plant has an attractive purple flower. Photos by Bob Nold. 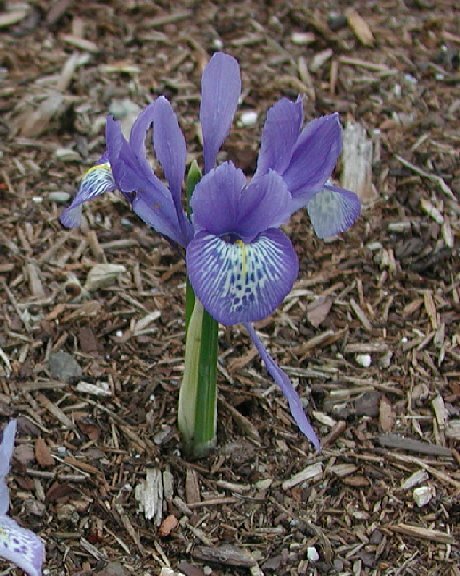 Iris reticulata var. bakeriana (Foster) B.Mathew & Wendelbo is from southern Turkey, northern Iraq, and western Iran where it grows on stony hillsides. 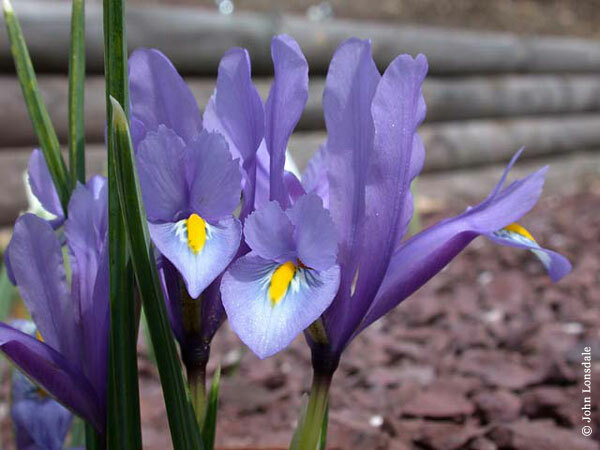 It has bluish lilac standards and styles. Falls are white with deep blue tips, lines, and blotches. 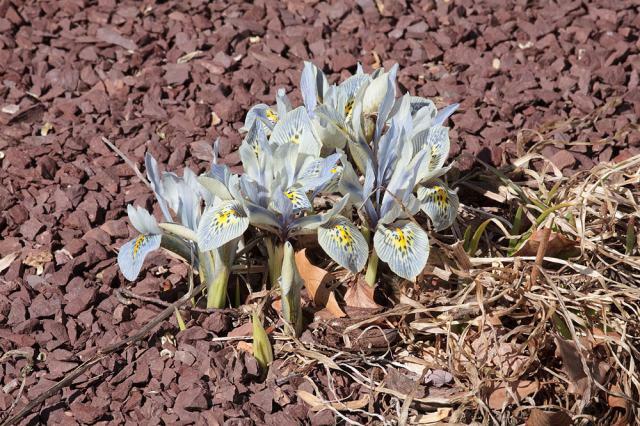 This species has nearly cylindrical leaves unlike other reticulata species. Photo by John Lonsdale. 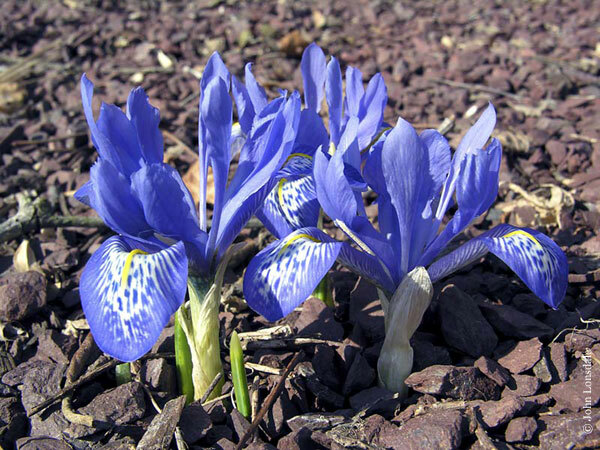 Iris reticulata cultivars shown below. 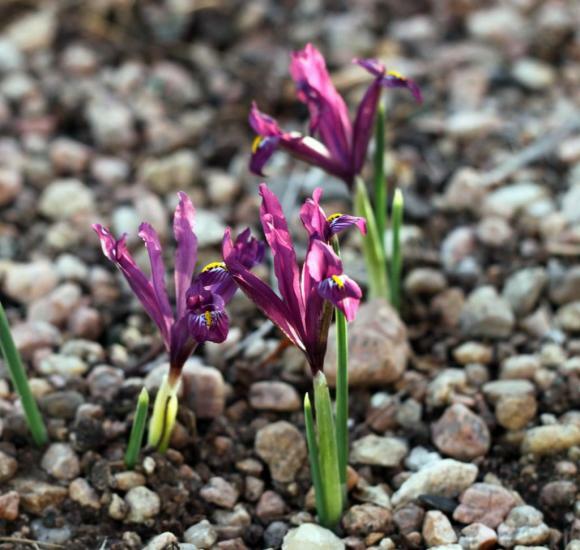 Iris reticulata 'Alida' photos by David Pilling. 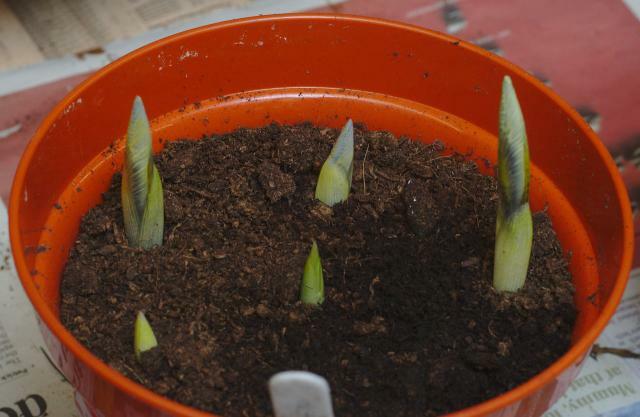 The first one is of bulbs on a 10 mm grid and the second is of shoots in late January. 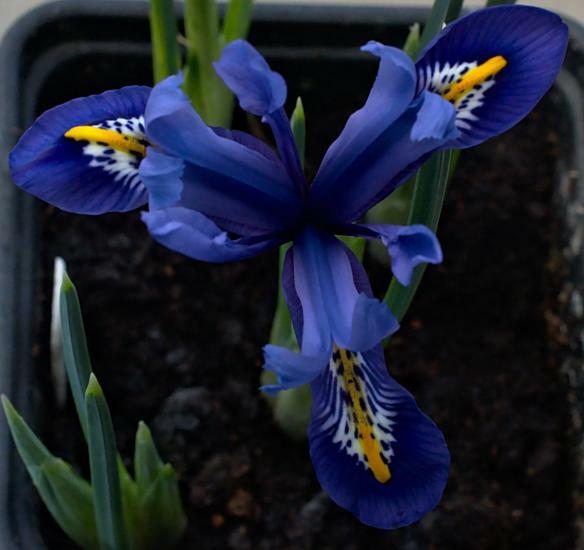 This Iris is scented; its name means 'small winged one'. Registered in 1997, it is a light blue sport of 'Harmony'. 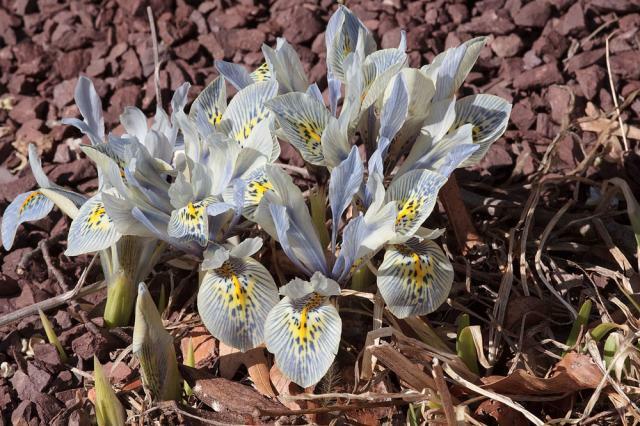 Iris reticulata 'Lovely Liza' is a hybrid between 'Joyce' and 'Clairette' colored plum and indigo with white falls. Photos by Mark Mazer and Bob Nold. 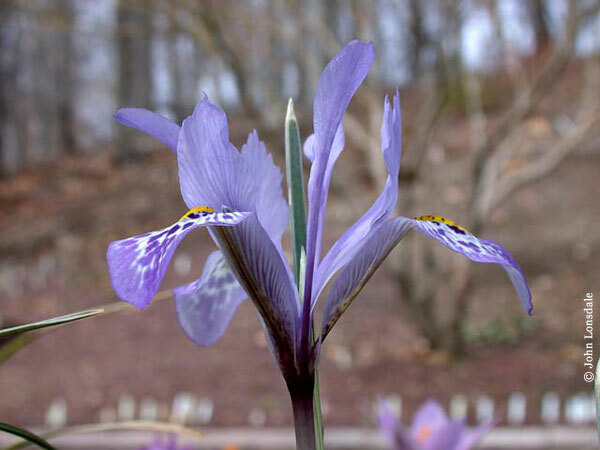 Iris 'Sheila Ann Germaney' is a another desirable hybrid between Iris histrioides and Iris winogradowii. It is similar to 'Katherine Hodgkin', but more even pale blue toned and showing less influence of the yellow palette. First photo by Mark McDonough taken April 8, 2004, at 7:00 AM when the temperature was 29 degrees Fahrenheit (frozen). The rest of the photos by John Lonsdale. 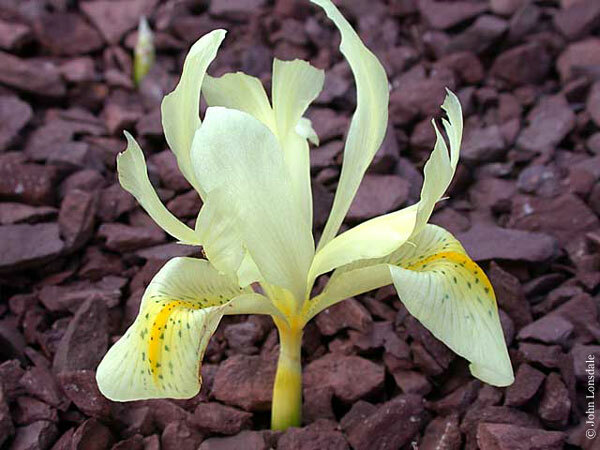 Iris winogradowii Fomin has pale primose yellow flower with green spots on the falls. 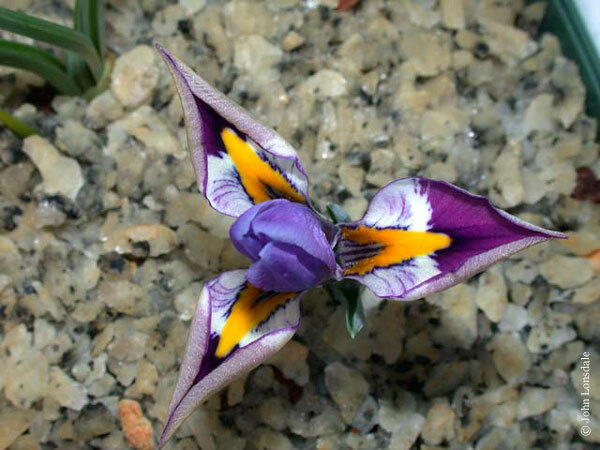 It is native to one mountain in the Caucasus (central Asia) where it grows in alpine meadows and is small at 4-6" (10-15 cm.) 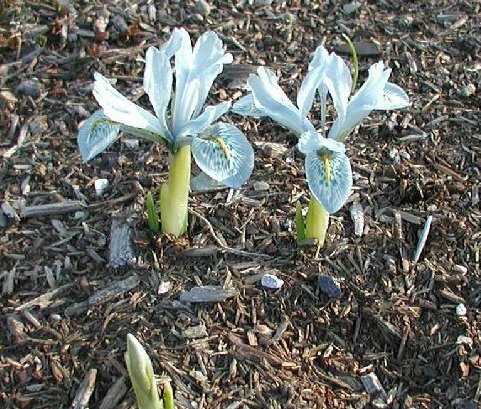 Iris winowgradowii tends to be stoloniferous in cooler growing conditions. The first two photos by John Lonsdale. 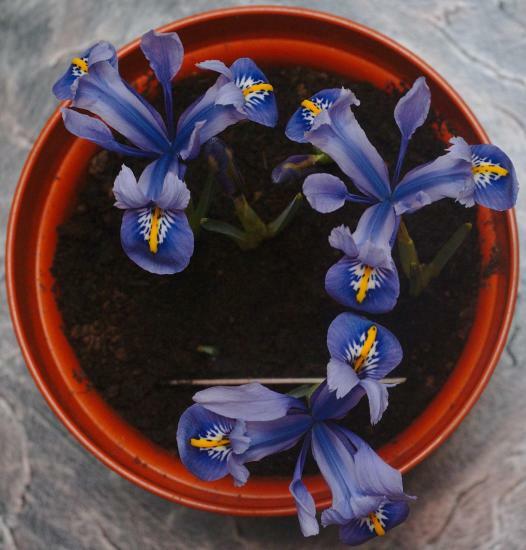 The last photo from Paige Woodward who writes that this species is difficult to grow in a pot. 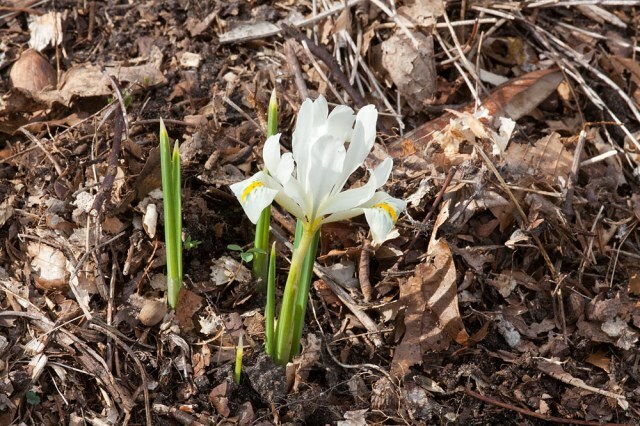 In gardens it prefers humus-rich, porous soil in cool shade and does best if replanted each year after a fairly dry summer. 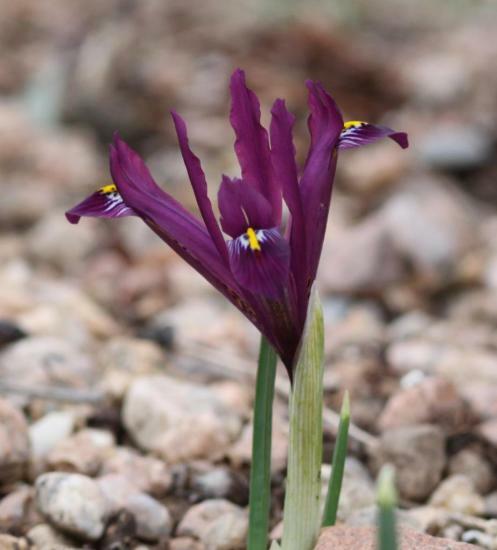 Iris zagrica B.Mathew & Zarrei from the Zagros Mountains of Western Iran has a long flower stalk with blue standards with a darker central zone and veined purple falls with a central orange crest. The seed capsule is held aloft on an arching pedicel. Photo by John Lonsdale.